A Copy Editor is responsible for proofreading the content for its concise, consistency, grammar and spelling before it is presented or published. Typically working at publications, website, and magazine and advertising department, the copy editors disburse the following roles and responsibilities – checking the writer’s final drafts, ensuring that the matter is easy and understandable, editing to fix errors and checking the accuracy of the content. Some of the copy editors also write suitable headings and subheading for the matter and take multiple assignments on a freelance basis. Copywriters need to have a great passion for writing and have an eye for details, they should have the ability to work under pressure and be able to detect errors and mistake at one glance. Copy editors should also be able to complete the work on time and have a very good command over written English. 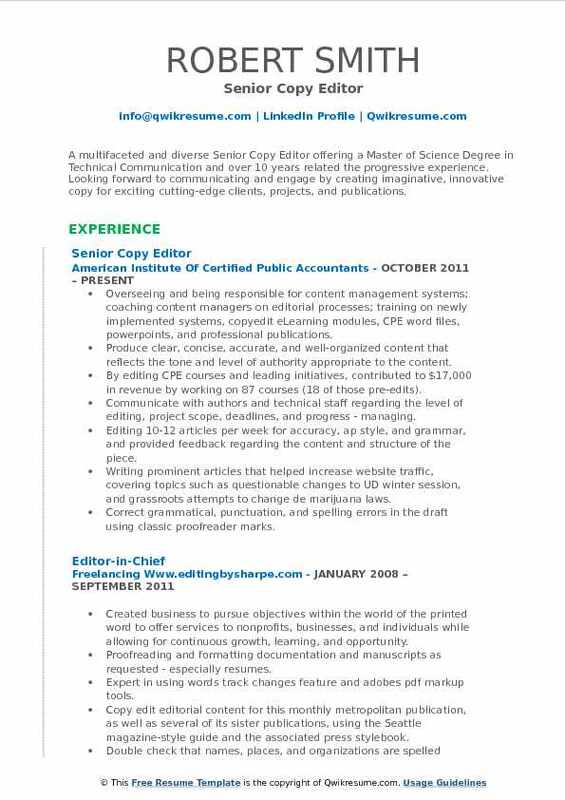 Most of these professionals depict in the Copy Editor Resume a degree in English or Journalism or related fields. 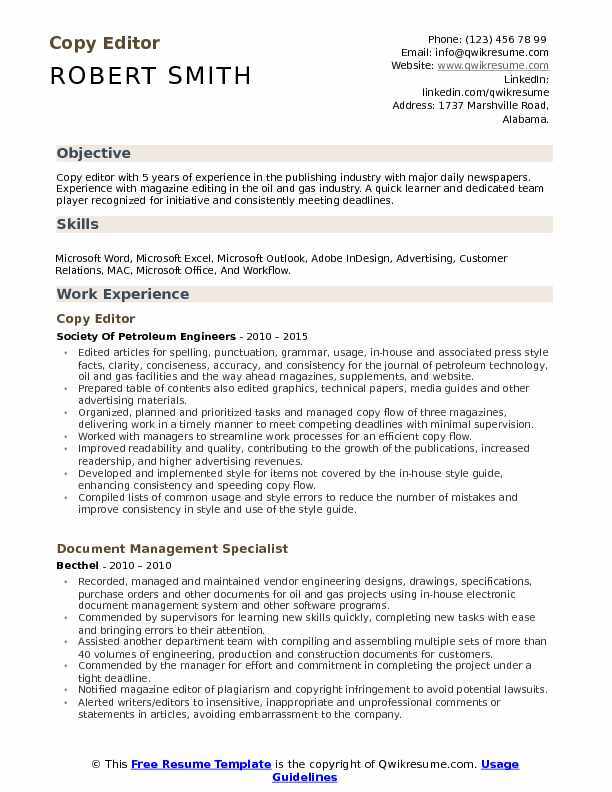 Objective : Copy editor with 5 years of experience in the publishing industry with major daily newspapers. Experience with magazine editing in the oil and gas industry. A quick learner and dedicated team player recognized for initiative and consistently meeting deadlines. Skills : Microsoft Word, Microsoft Excel, Microsoft Outlook, Adobe InDesign, Advertising, Customer Relations, MAC, Microsoft Office, And Workflow. Edited articles for spelling, punctuation, grammar, usage, in-house and associated press style facts, clarity, conciseness, accuracy, and consistency for the journal of petroleum technology, oil and gas facilities and the way ahead magazines, supplements, and website. Prepared table of contents also edited graphics, technical papers, media guides and other advertising materials. Organized, planned and prioritized tasks and managed copy flow of three magazines, delivering work in a timely manner to meet competing deadlines with minimal supervision. Worked with managers to streamline work processes for an efficient copy flow. Improved readability and quality, contributing to the growth of the publications, increased readership, and higher advertising revenues. Developed and implemented style for items not covered by the in-house style guide, enhancing consistency and speeding copy flow. Compiled lists of common usage and style errors to reduce the number of mistakes and improve consistency in style and use of the style guide. 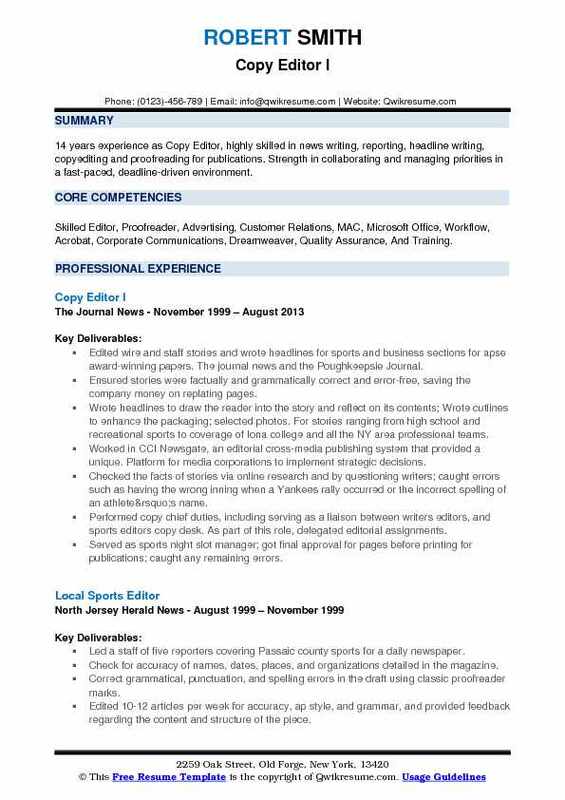 Summary : 14 years experience as Copy Editor, highly skilled in news writing, reporting, headline writing, copyediting and proofreading for publications. Strength in collaborating and managing priorities in a fast-paced, deadline-driven environment. 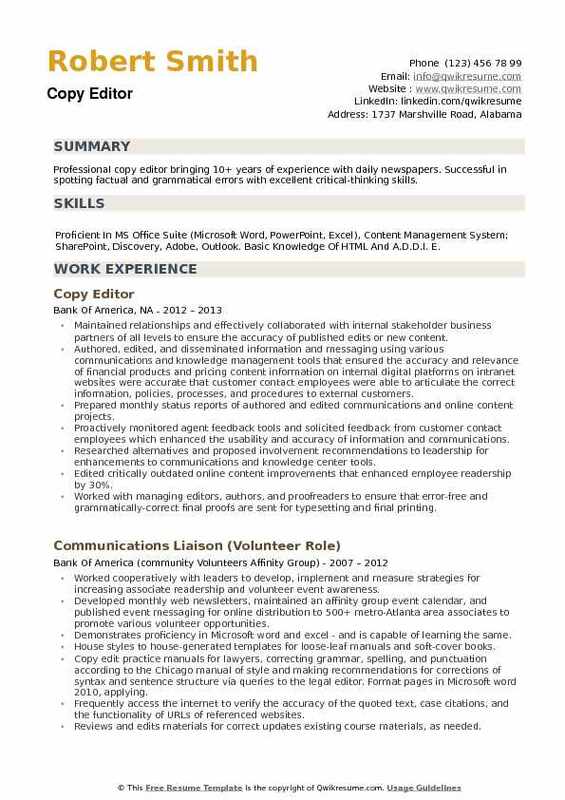 Skills : Skilled Editor, Proofreader, Advertising, Customer Relations, MAC, Microsoft Office, Workflow, Acrobat, Corporate Communications, Dreamweaver, Quality Assurance, And Training. Edited wire and staff stories and wrote headlines for sports and business sections for apse award-winning papers. The journal news and the Poughkeepsie Journal. Ensured stories were factually and grammatically correct and error-free, saving the company money on replating pages. Wrote headlines to draw the reader into the story and reflect on its contents; Wrote cutlines to enhance the packaging; selected photos. For stories ranging from high school and recreational sports to coverage of Iona college and all the NY area professional teams. Worked in CCI Newsgate, an editorial cross-media publishing system that provided a unique. Platform for media corporations to implement strategic decisions. Checked the facts of stories via online research and by questioning writers; caught errors such as having the wrong inning when a Yankees rally occurred or the incorrect spelling of an athlete’s name. Performed copy chief duties, including serving as a liaison between writers editors, and sports editors copy desk. As part of this role, delegated editorial assignments. Served as sports night slot manager; got final approval for pages before printing for publications; caught any remaining errors. Mentored younger reporters; helped to edit interns develop their craft and sharpen skills. Served as the resident expert for baseball, pro wrestling, and facts about a long island, NY. Summary : Award-winning Copy Editor with over 29 years of vast experience in both print and digital journalism, editing breaking news, in-depth analysis as well as providing extensive coverage of the city music and arts scenes. Meticulous, versatile and creative professional dedicated with proven success and easy adaptability to various publishing tools. 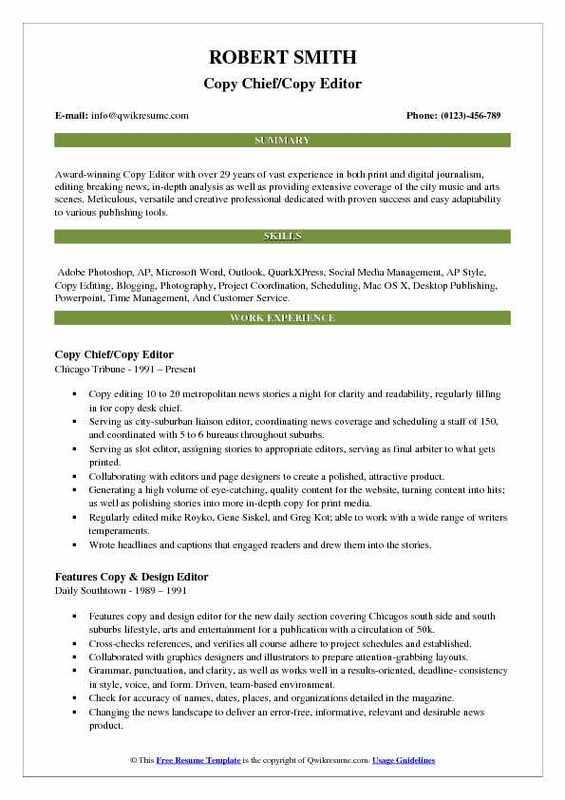 Skills : Adobe Photoshop, AP, Microsoft Word, Outlook, QuarkXPress, Social Media Management, AP Style, Copy Editing, Blogging, Photography, Project Coordination, Scheduling, Mac OS X, Desktop Publishing, Powerpoint, Time Management, And Customer Service. Copy editing 10 to 20 metropolitan news stories a night for clarity and readability, regularly filling in for copy desk chief. Serving as city-suburban liaison editor, coordinating news coverage and scheduling a staff of 150, and coordinated with 5 to 6 bureaus throughout suburbs. Serving as slot editor, assigning stories to appropriate editors, serving as final arbiter to what gets printed. Collaborating with editors and page designers to create a polished, attractive product. Generating a high volume of eye-catching, quality content for the website, turning content into hits; as well as polishing stories into more in-depth copy for print media. Regularly edited mike Royko, Gene Siskel, and Greg Kot; able to work with a wide range of writers temperaments. Wrote headlines and captions that engaged readers and drew them into the stories. Summary : A multifaceted and diverse Senior Copy Editor offering a Master of Science Degree in Technical Communication and over 10 years related the progressive experience. Looking forward to communicating and engage by creating imaginative, innovative copy for exciting cutting-edge clients, projects, and publications. 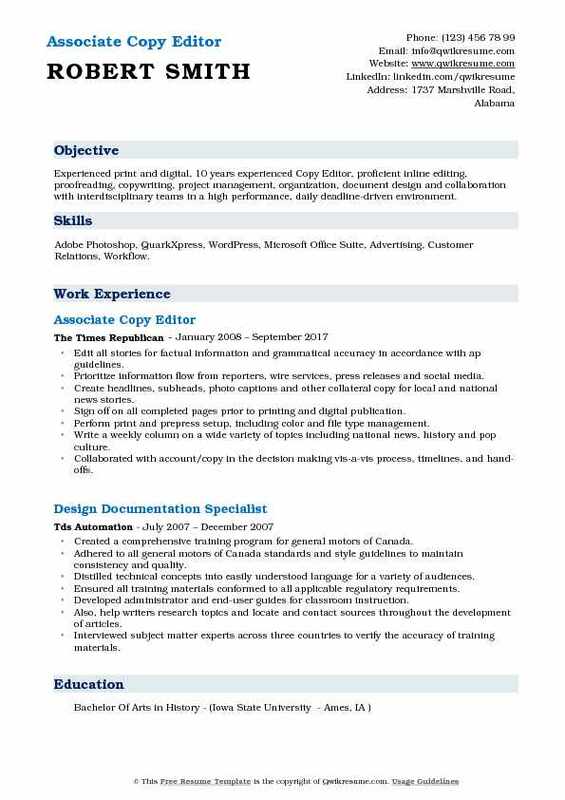 Skills : Acrobat, Corporate Communications, Dreamweaver, Quality Assurance, Training, Fact-checking, Copy Editing, AP Style, And MS Office. Overseeing and being responsible for content management systems; coaching content managers on editorial processes; training on newly implemented systems, copyedit eLearning modules, CPE word files, powerpoints, and professional publications. Produce clear, concise, accurate, and well-organized content that reflects the tone and level of authority appropriate to the content. By editing CPE courses and leading initiatives, contributed to $17,000 in revenue by working on 87 courses (18 of those pre-edits). Communicate with authors and technical staff regarding the level of editing, project scope, deadlines, and progress - managing. Editing 10-12 articles per week for accuracy, ap style, and grammar, and provided feedback regarding the content and structure of the piece. Writing prominent articles that helped increase website traffic, covering topics such as questionable changes to UD winter session, and grassroots attempts to change de marijuana laws. Correct grammatical, punctuation, and spelling errors in the draft using classic proofreader marks. Summary : Sixteen years of experience as a Copy Editor, editing book club catalogs and direct mailings Fourteen years experience in magazine publishing Knowledge of all stages of the editorial process. Ensured the accuracy of all information for print and online promotions and member correspondence for children's book of the month and literary guild book clubs, among others. Proofread promotions for grammar, company style, offer information, legal compliance, adherence to postal regulations and copyright and trademark usage. Reviewed layouts, first proofs and final proofs for each assigned club. Reviewed club websites to ensure that correct copy, images, and features were troubleshot and queried informational discrepancies to appropriate departments including marketing, editorial, account management, mailing operations and legal. Check illustrations and captions are correct. Ensure that articles are written in accordance with the style guide. Work closely with writers, suggesting changes to enhance articles' readability, conciseness, and style. 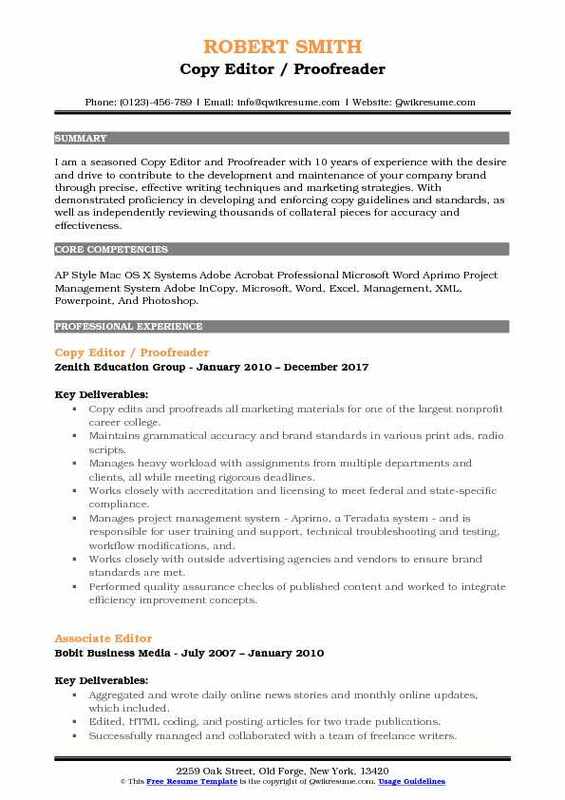 Summary : Experienced print and digital, 10 years experienced Copy Editor, proficient inline editing, proofreading, copywriting, project management, organization, document design and collaboration with interdisciplinary teams in a high performance, daily deadline-driven environment. 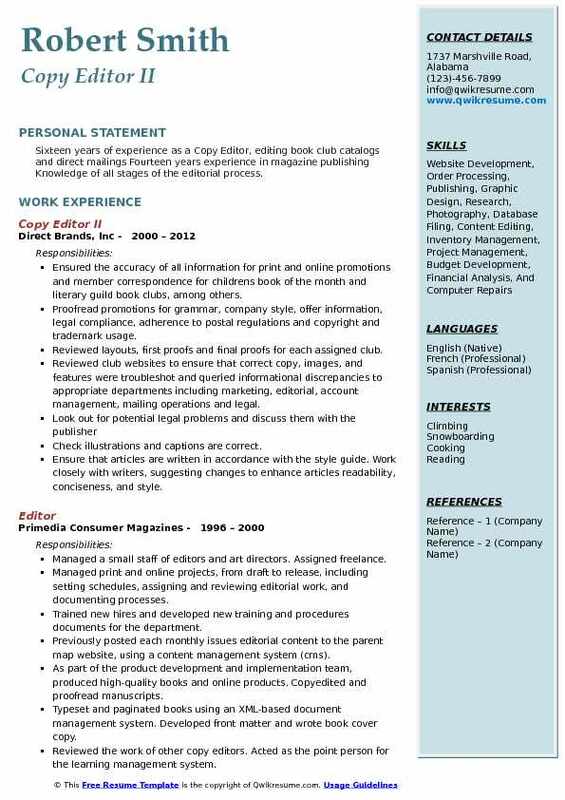 Skills : Adobe Photoshop, QuarkXpress, WordPress, Microsoft Office Suite, Advertising, Customer Relations, Workflow. Edit all stories for factual information and grammatical accuracy in accordance with ap guidelines. Prioritize information flow from reporters, wire services, press releases and social media. Create headlines, subheads, photo captions and other collateral copy for local and national news stories. Sign off on all completed pages prior to printing and digital publication. Perform print and prepress setup, including color and file type management. Write a weekly column on a wide variety of topics including national news, history and pop culture. Collaborated with account/copy in the decision making vis-a-vis process, timelines, and hand-offs. Copy editing and proofreading manuscripts for writers seeking self-publishing in the urban fiction genre. Summary : Detail-oriented professional with 11+ years experience as a Copy Editor, performing administrative, customer service, and creative tasks Proficient at using databases to fulfill customer orders and update customer e-mail lists and assembling and testing e-mail blasts Use strong written and verbal communication skills to ensure newsletter publication schedules are followed and websites are updated. 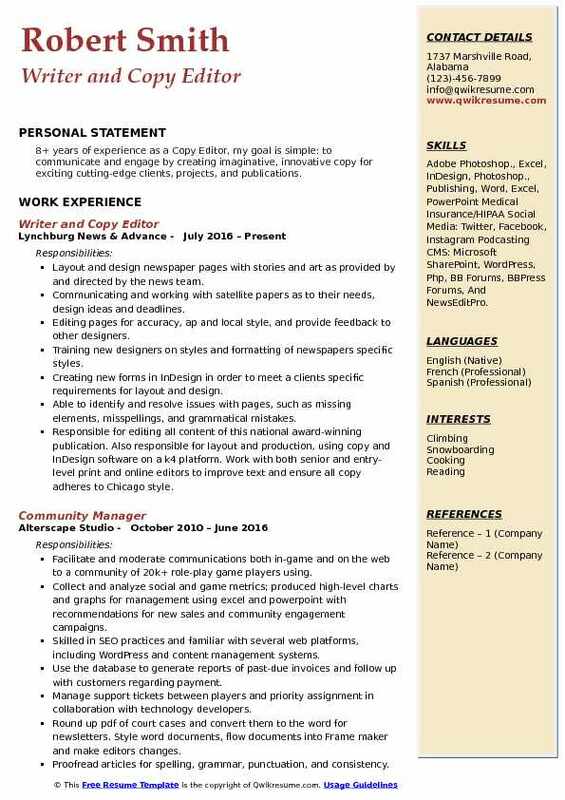 Skills : Editing, Proofreading, Wordpress, Print Design, Indesign, Photoshop, AP Style, HTML 5, Office, Typing 75 WPM, Content Management, Editing, Etc. Editing and proofreading hr-related articles, newsletters, and blog posts for spelling, grammar, punctuation, clarity, and style using the Chicago manual of style and company style guide. Using knowledge of readers needs and developing news to identify important and/or urgent articles and rush publication on blogs and websites. Writing e-mails to alert readers that important and/or urgent articles are available. Include links to articles, newsletters, and authors bio pages. Creating biweekly e-mail updating readers on new blog posts, news alerts, and articles. Ensure that correct artwork is used and that links to website content and marketing landing pages are accurate and functional. Managing a bank of approximately 50 fresh filler articles. Hunt for quality filler articles, make revisions to new pieces and retire out-of-date articles. Suggesting and make revisions to articles, newsletters, and blog entries. Check for accuracy of names, dates, places, and organizations detailed in the magazine. Summary : I am a seasoned Copy Editor and Proofreader with 10 years of experience with the desire and drive to contribute to the development and maintenance of your company brand through precise, effective writing techniques and marketing strategies. With demonstrated proficiency in developing and enforcing copy guidelines and standards, as well as independently reviewing thousands of collateral pieces for accuracy and effectiveness. Skills : AP Style Mac OS X Systems Adobe Acrobat Professional Microsoft Word Aprimo Project Management System Adobe InCopy, Microsoft, Word, Excel, Management, XML, Powerpoint, And Photoshop. Copy edits and proofreads all marketing materials for one of the largest nonprofit career college. Maintains grammatical accuracy and brand standards in various print ads, radio scripts. Manages heavy workload with assignments from multiple departments and clients, all while meeting rigorous deadlines. Works closely with accreditation and licensing to meet federal and state-specific compliance. Manages project management system - Aprimo, a Teradata system - and is responsible for user training and support, technical troubleshooting and testing, workflow modifications, and. Works closely with outside advertising agencies and vendors to ensure brand standards are met. Performed quality assurance checks of published content and worked to integrate efficiency improvement concepts. Summary : 8+ years of experience as a Copy Editor, my goal is simple: to communicate and engage by creating imaginative, innovative copy for exciting cutting-edge clients, projects, and publications. Skills : Adobe Photoshop., Excel, InDesign, Photoshop., Publishing, Word, Excel, PowerPoint Medical Insurance/HIPAA Social Media: Twitter, Facebook, Instagram Podcasting CMS: Microsoft SharePoint, WordPress, Php, BB Forums, BBPress Forums, And NewsEditPro. Layout and design newspaper pages with stories and art as provided by and directed by the news team. Communicating and working with satellite papers as to their needs, design ideas and deadlines. Editing pages for accuracy, ap and local style, and provide feedback to other designers. Training new designers on styles and formatting of newspapers specific styles. Creating new forms in InDesign in order to meet a client's specific requirements for layout and design. Able to identify and resolve issues with pages, such as missing elements, misspellings, and grammatical mistakes. Responsible for editing all content of this national award-winning publication. Also responsible for layout and production, using copy and InDesign software on a k4 platform. Work with both senior and entry-level print and online editors to improve text and ensure all copy adheres to Chicago style. Responsible for the content, formatting, and functionality of emails/sites from inception to launch. Headline : Professional copy editor bringing 10+ years of experience with daily newspapers. Successful in spotting factual and grammatical errors with excellent critical-thinking skills. Skills : Proficient In MS Office Suite (Microsoft Word, PowerPoint, Excel), Content Management System; SharePoint, Discovery, Adobe, Outlook. Basic Knowledge Of HTML And A.D.D.I. E.
Maintained relationships and effectively collaborated with internal stakeholder business partners of all levels to ensure the accuracy of published edits or new content. Authored, edited, and disseminated information and messaging using various communications and knowledge management tools that ensured the accuracy and relevance of financial products and pricing content information on internal digital platforms on intranet websites were accurate that customer contact employees were able to articulate the correct information, policies, processes, and procedures to external customers. Prepared monthly status reports of authored and edited communications and online content projects. Proactively monitored agent feedback tools and solicited feedback from customer contact employees which enhanced the usability and accuracy of information and communications. Researched alternatives and proposed involvement recommendations to leadership for enhancements to communications and knowledge center tools. 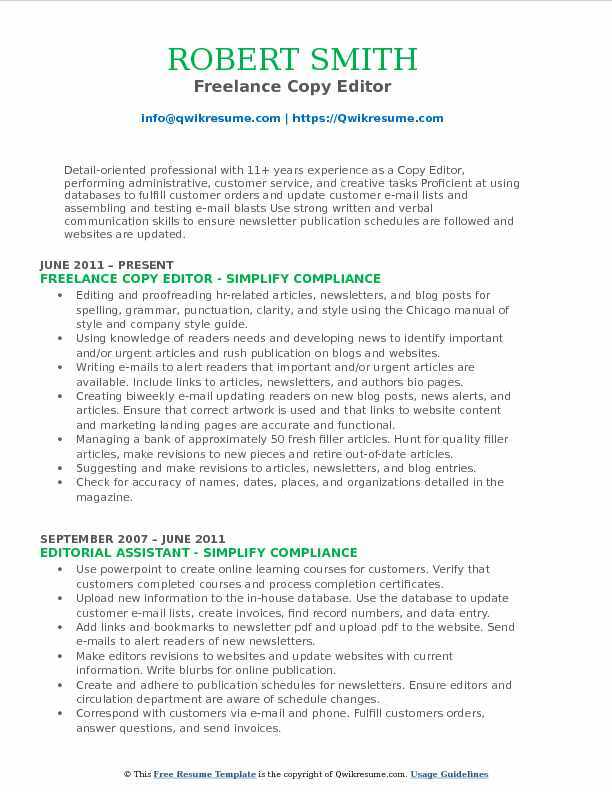 Edited critically outdated online content improvements that enhanced employee readership by 30%. Worked with managing editors, authors, and proofreaders to ensure that error-free and grammatically-correct final proofs are sent for typesetting and final printing.